All Public Works staff provides Snow and Ice Removal services for approximately 200 miles of city streets, 330 cul-de-sacs and 32 miles of a path / trail system. The goal is to provide safe, convenient travel and to prevent deterioration of city streets caused by winter conditions. When streets are covered with snow, it can be very difficult for snowplow operators to determine the edge of the road. Staking the curb with wood laths enables the operator to locate the edge of the road during the first or second snowfall. 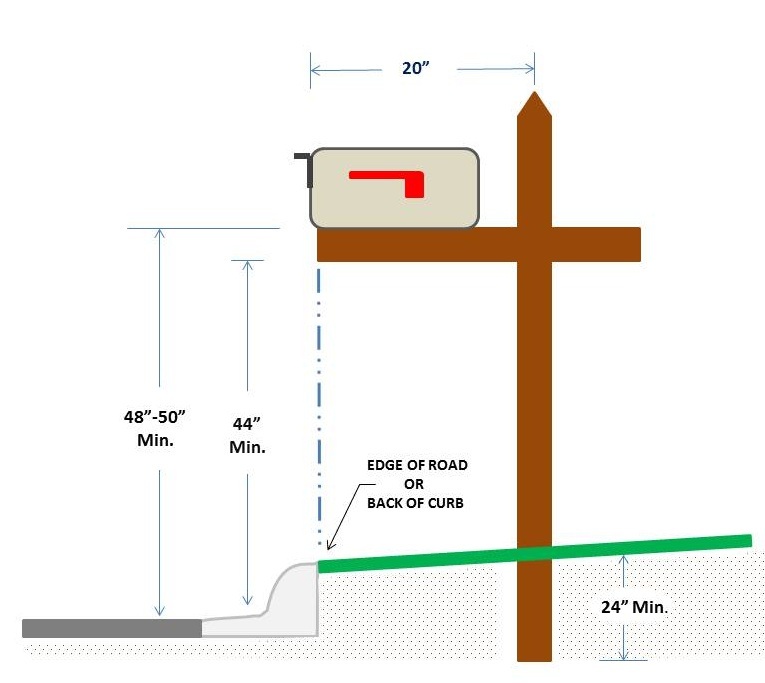 Curb stakes are intended to be used as a guide for the plow operator, not as a fence protector along property. The city is not responsible for damaged sod along the boulevard or sprinkler systems put on the boulevard or along the curb. This is the responsibility of the property owner. Stakes are available in October and can be picked up between 8:00 a.m. to 4:30 p.m., Monday through Friday at the receptionist desk at City Hall, 1685 Crosstown Blvd NW. Decorative mailboxes are not within the requirements and will not be replaced if damaged. The base of the box should be 48 to 50 inches above street level. The mailbox should be secured to the base and post, and the post in good condition. The post should be 20 inches back from the curb. The face of the mailbox should line up with the curb. The snowplow wing needs the 48 inches height clearance to avoid hitting the box and the 20 inches from the curb to clear the post. The city does not assume liability for mailboxes damaged during plowing operations, unless it is determined the plow made direct contact with a mailbox that is properly installed using the standard 4 x 4 post and metal box requirements. There should not be any plastic newspaper tubes or attachments to the mailbox below the 44 inches minimum height requirement. CAUTION - Before digging, locate underground utilities including gas, telephone, electrical, cable TV, water and sewer. Do not plow, shovel, or blow snow onto or across any public street according to the Minnesota State Statue #160.27. Our Snow and Ice Removal diagram (PDF) shows the area of snow to remove to allow snow from plow truck to go, and to reduce the amount that is left in your driveway. Caution should be taken when working in and around roadway for oncoming traffic. Since there are a high number of cul-de-sacs and dead end streets in the city, it takes awhile for the specialized equipment to completely remove snow from them. The large snowplow may clear a portion of the street first, then the cul-de-sac equipment will complete the clean up. Main city streets are cleared first with large plows before the smaller equipment begins clearing cul-de-sacs. All trails within a 2 mile radius of a school will be plowed as soon as possible during plowing operations. The trails nearest the schools is the first priority, since there has been a large increase in the numbers of walkers. The entire trail system will be plowed during regular work shifts after a snowfall. Ordinance 218 is enforced - It shall be unlawful for any person to park, permit, or allow any vehicle to stand or remain on any city street or right-of-way or on the traveled portion of the road or to obstruct the flow of traffic, unless for an emergency between the hours of 1 and 6 a.m. from November 1st to April 15th except as provided by this ordinance. It is also unlawful to park or permit to be parked on any city street after 2 inches or more of snowfall until such time the snow has been plowed from said street. Many homeowners install sprinkler systems and place the sprinkler heads in the road right-of-way (along the curb) when installing the system. The city is not responsible to repair or replace any sprinkler head in the road right-of-way that is damaged during the snowplowing operations. Since the sprinkler head is placed in the easement it is the property owner's responsibility to repair if damaged. Place garbage cans and recycle bins 2 feet behind the curb at the end of the driveway, not in the roadway.